I like the Taste of Home baking book. It has the diversity one needs and the recipes are not formidable. I love savory baked goods and decided I was in the mood for anything that was no sweet. I looked through the recipes and got my choices down to the Amish Onion Cake, the Cheddar Casserole Bread and the Vidalia Onion Custard Bread. For the sake of expedience, I chose the Cheddar Casserole Bread and it is a winner. It is a good snack and a delicious breakfast or lunch with some greens on the side. In a small bowl, combine milk, mayo and egg. Add wet mixture to the dry ingredients and mix until moistened. Add the cheese and onions and mix them through. Spoon onto a greased 9 inch baking pan. Bake at 425 degrees for 25 minutes or until a thin knife or toothpick inserted, comes out clean. Mine took an extra 7 minutes. Cool down and eat or store in the refrigerator. This looks delicious, Chaya! My kind of meal, quick, easy and delicious! Thanks for sharing with CYB! I love Taste of Home too, Chaya! 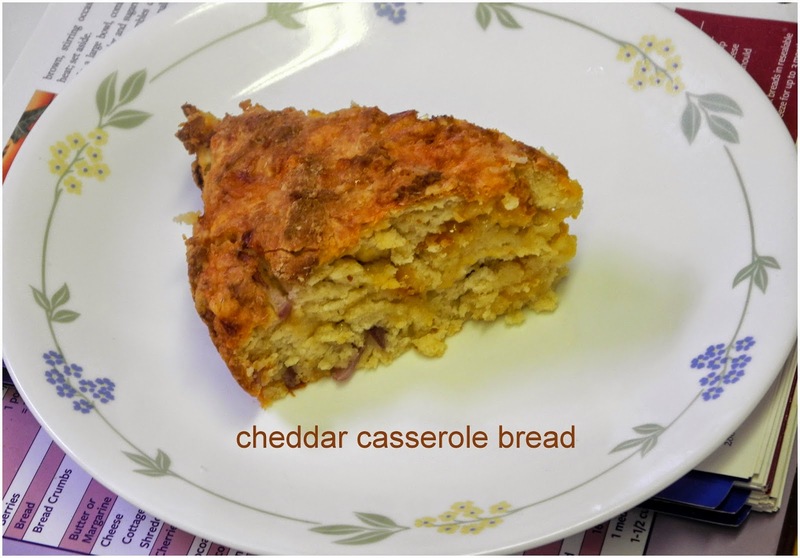 Your Cheddar Casserole Bread looks delicious! Thank you for sharing it with us at the Hearth and Soul hop.